TourTrax FormsAPI - TourTrax - Software for Digital Logs, Forms, and more. What is an API? By now I'm sure that almost everyone is familiar with the term. API stands for Application Programming Interface. It is used to access data that has been captured already, and display it in a custom view. This could be in a web browser, software on your computer, or a mobile application. TourTrax's FormsAPI allows you to take your raw data from TourTrax and analyze it! Using a custom request and/or an application, you can put all the information you need in one spot. This can help with workflow and reduce the amount of time it takes when you have multiple systems! Analyze your data to identify problem areas and create a solution, not more problems! Combine multiple information streams, and display it all in one application! Communicate with multiple applications at once, and display only the information you want to see! TourTrax's API allows you to list all forms/information that have been submitted by your users and/or employees. You can decide to display all, or only some of the data, making it a very powerful analytical tool! 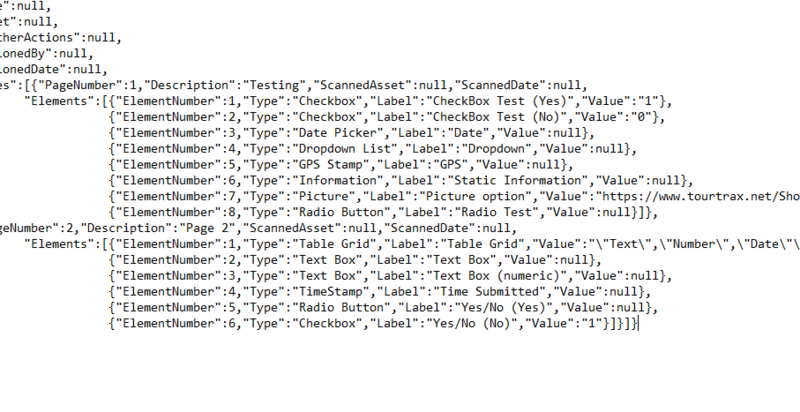 Here we can see some of the raw form data that is available to us from the API. This example (left) is in XML format, a very popular file format for analyzing data. Easy to manipulate and display, you can take the raw data and do with what you want! 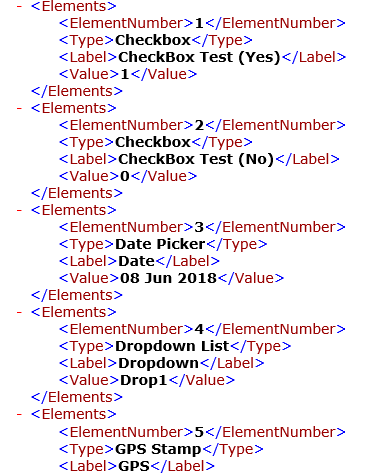 In the above example you can see the data in another format, JSON. Check out our Example Application Below!